Zombies in the Glitter Mist is the first of my Barry M polishes only Halloween nail art this week. 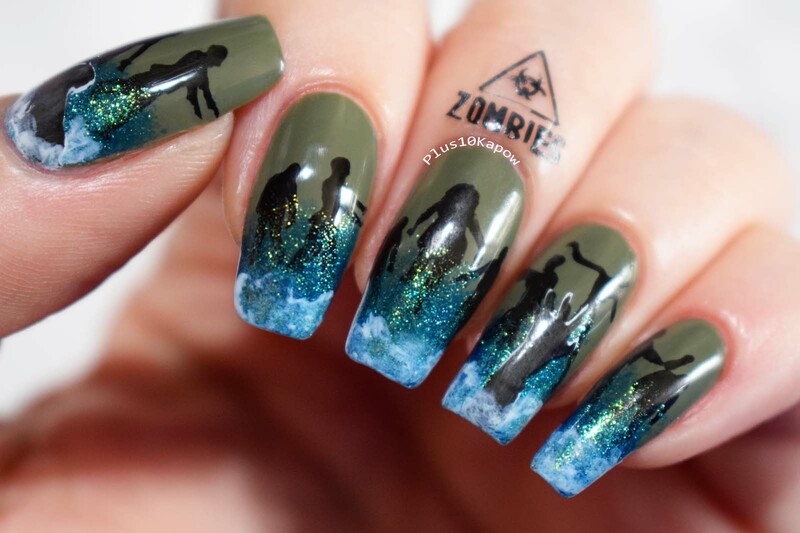 So it is technically an improved of my previous B-Movie Zombies nail art but I think it looks so much better now and I actually prefer it this way. Also, who else gets actual B-Movie vibes from the name Zombies in the Glitter Mist? It sounds like something that Rifftrax would have in their library and I would definitely watch it if they did. Polishes used: (All Barry M's) Matcha, Crystal Blue, Cotton and Black Forest. Topped with Barry M Plumpy Topcoat. I have been using Cotton as my white when stamping for a while now but I was actually surprised at how well Black Forest stamps, if you are on a budget and you need black and white polishes that are both great for regular polish and stamping, then look no further. I also stamped the radioactive image and Zombies onto my finger again (because it looks fun and I am still down for cuticle tattoos that actually work and are nerdy/Halloween related) using Black Forest. As you may remember from my swatch here, Crystal Blue is a stunning blue polish with a green shimmer, but over Matcha and Black Forest it looks more like a teal with a lime green shimmer and I am fully in love with it. All stamped images are from the Uberchic Zombie Love stamping plate. More Halloween mani's on their way, are there any that you would like to see?